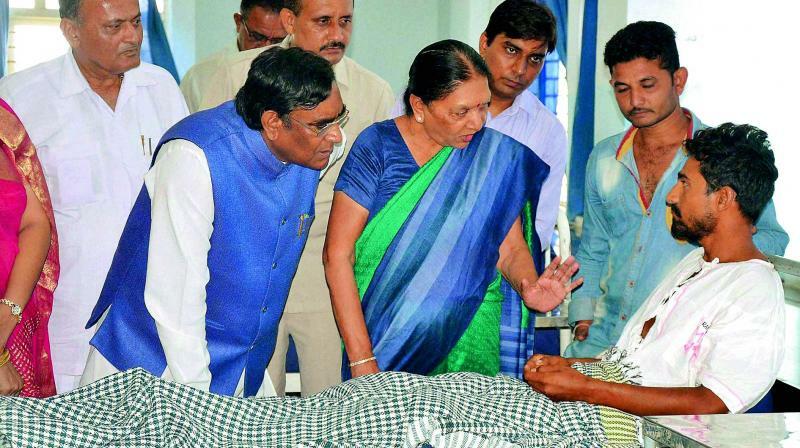 Dalits across Gujarat, especially in Saurashtra, may have agitated against the July 11 incident, when four youths belonging to the Rohit (chamar) sub-caste were violently beaten up with iron rods after being tied with SUV, first in village Mota Samadhiyala and then in Una town of south Saurashtra. But the BJP leadership in Gujarat appears to think that the incident is “not much of political consequence”, and people would forget about it “very soon”. Meanwhile, keen political observers, suggesting BJP indifference, point out that Gujarat chief minister Anandiben Patel gave her first statement condemning incident only on July 18, a week after the incident. Finding the agitation spreading to different towns of Saurashtra, she towards the state government’s resolve to act quickly by filing charge sheet would be filed “within 60 days”. Announcing a CID probe, she visited Una on July 20 when, say BJP sources, she was “asked to go there by Delhi” because the matter was acquiring “national dimensions”. There is reason for the BJP leadership to feel "relaxed" despite restiveness among its Dalit leaders. Forming less than seven per cent of the population of Gujarat, Dalits, say observers, “do not count” much in state politics, unlike Uttar Pradesh and Punjab where they are 21 and 26 per cent respectively. As for the Congress, it reacted to the Una incident only on July 19, a day after the chief minister made her first announcement. Opposition leader in the Gujarat state assembly Shankarsinh Vaghela and state BJP president Bharatsinh Solanki issued a statement condemning the incident and seeking a date to meet the governor in order to “represent” against the BJP government’s “indifference”!